With the holiday season upon us, today’s choice carries an appropriate meaning. Thanks to Lola for suggesting our Name of the Day: Dorothea. Shortly after Lola asked about Dorothea, Nessa requested that we cover Dorothy. While one is an elegant four-syllable substitute for Alexandra, and the other is a spunky, three-syllable moniker that brings to mind hits like Kimberly, they share the same roots. In Greek, doron means gift and theos means god. So Dorothea, Dorothy – and the name formed by flipping the pieces, Theodora – all translate to “gift of God.” Not a bad sentiment in the final days before Christmas. While the masculine Latin Dorotheus lost out to the far more popular Theodoros, the opposite is true for the feminine. In French Dorothea became Dorothée, which brings us to Dorothy. L. Frank Baum chose the name for the heroine of his 1900 novel, The Wizard of Oz. Dorothy had been in use since at least the 1500s in England. She ranked #27 in the US the year the book was published. But by 1904, she’d entered the Top Ten and would stay there until 1939, spending eight of those years at #2. While Judy Garland’s big screen Dorothy doubtless inspired some parents, the year of the movie’s release – 1939 – marked her last year in the Top Ten. By 1961, she’d fallen out of the Top 100 and 2006 marked her last year in the rankings. Dorothea of Montau is the real deal, though she didn’t come along until the 1300s. A famously devout woman, she’s said to have converted her husband. 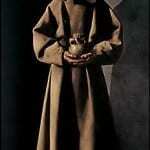 After his death, she became a hermit known for her visions. All three saints are sometimes called Dorothy, as well. Dorothy was also the given name of one of Doctor Who’s companions (though she was usually called by her nickname, Ace). She’s Elmo’s goldfish on Sesame Street;The Wiggles features Dorothy the Dinosaur. At the other end of the age range, Bea Arthur’s Golden Girl was Dorothy Zbornak. There’s also witty Algonquin Round Table writer Dorothy Parker and glamorous, ground breaking actress Dorothy Dandridge. Some feel dated, while others have an appealing retro-vibe. We’re fond of the Slavic Dasia. You might even use Daisy. We suspect Dorothea stands a better chance for a comeback circa 2008. Dorothea never reached her sister’s heights, and has been unranked since 1973. She fits with Samantha and Alexandra and will appeal to many as a charming antique. But don’t count Dorothy out. That three syllable, ends-in-y construct remains popular. Think of past hits like Kimberly, Stephanie and Tiffany, and current hot choices Avery, Delaney, Natalie and Trinity. Either name could suit your little gift of a girl perfectly. At a BBQ this weekend, I met a little, 5-yo “Dottie.” The name wore extremely well. Prior to this encounter, I would have written it off as an old-lady name with no further thought. I would have been so wrong. It was charming. I really like Dorothy – the meaning, the fact that it’s recognizable as an established name, yet it’s not even in the top 1000 anymore. Plus I really like the nickname Dot, especially as my husband & I met online – “dot com”. I think the Wizard of Oz link would be cute too – to get a Dorothy costume to dress up in. Plus then we’d have two Golden Girls (Rose & Dorothy) and two Wiggles characters (Henry & Dorothy). Not that I watch either show, but it would be a fun random link. There’s a little Dorothy in our neighborhood. It wears really well. I don’t know if they’ve gone for the Wizard of Oz costume at Halloween, but I totally would! 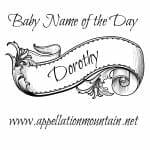 And Dot is a darling nickname, though the local Dorothy doesn’t seem to use a short form. I like Dolly, too. In some ways, it is so much easier to name the first child, isn’t it? I didn’t notice the Wiggles link, but the Golden Girls came to mind. Yep, Shannon, Over here in New England she’s dor-oh-thee. Heck, I grew up in NJ and say it the same way. Maybe it’s an East coast thing? Or just Northern? I am definitely Northern. I’ve never seen Dasia in Cyrillic (bet I wouldn’t even recognise it if I did!) but I grew up hearing Dah-zhah It falls in line ith what little I know about Russian considering my maternal line originates there. But I’ve recently seen it spelled Dosia, and pronounced the same way. Anyone know if that pronunciation’s right? Indeed a dacha is a summer house in Russian! Wow – impressive! I picture birch forests and little wood cabins and gathering wild berries and mushrooms… mostly because of the language exercises in the majority of Russian 101 textbooks from way back when – but it’s all good stuff. I’d guess that the closest Russian version of Dasia is Dasha (DAH shah) – the diminutive for Darya (usually transliterated and made to sound like Daria – DAR ee uh – in the states which is unfortunately a little too close to diarrhea to me, when Darya is so nice – it’s all due to those palatized consonants that don’t exist in English but run rampant in Russian…). Is Dasia said DAH zhah, DAY, zeeya, DAH seeya or like Asia with a “D” in front? I wasn’t sure – I had never heard the name before… or maybe it’s just that I’ve never seen in written in non-cyrillic writing like that. BTW – I really like Anya – lovely name – sorry it was vetoed! It’s actually the nickname for Anna in Russian, but so much more sophisticated sounding. As I say Dasia, I wonder about one thing – JNE, your Russian is better than mine – isn’t a dacha a summer house? I suppose it’s a fairly obscure (and neutral) reference, but it did pop into my head. Dorothea would be exactly right as a sister for Josephine, Lola! BTW, there’s a very appealing character called Dorota on Gossip Girl. She’s the maid to one of the main characters, so I’m guessing she was intended to be a minor figure. But I really get a kick out of her! And guess who’s never read Middlemarch! Oops … I’m fairly sure I’ve *bought* Middlemarch and intended to read Middlemarch. I’m adding it to my 2009 to-do list! I love Dorothea! I might use it when I have kids, provided that I stick with my current boyfriend. (I sure hope so) His grandmother is a Dorothy, and an extremely sweet woman. I just love the regal sound and nickname options. Kylie, I think that Dasia could work as a standalone in the US. It sounds like a full name here and recalls Daisy, so I definitely think it would work. Dorothy was my grandmother’s name. I would love to honor her, but unfortunately she HATED the name and went by her middle all her life. The MN is much worse to me. In fact, I like Dorothy but I know that my grandmother would roll over in her grave were I to use it. Any thoughts on using Dasia as a stand-alone? I think it’s sweet, and would be a way to honor my grandmother without upsetting her memory. Oh, and I also thought of “Finding Nemo” when I saw the nickname Dory – that’s the 2nd lead and the fish voiced by Ellen DeGeneres in the film – I bet the kids would get a big kick out of the link to Nemo. I like Dorothea (Dorothy is nice too, but the link to Oz is a little too strong for me). Also, the option for Tea or, even better, Thea as a nickname really appeals – I even like Thea on its own. Since my baby girl was very nearly Isadora (had she come a couple weeks earlier, I’m sure that would be her name), I also like the “doro/dora” part too! However, Doreen is my MIL and, while I love her, I have a thing for not using relatives’ names no matter the relative, so I would personally lean away from the Doreen/Do/Dodo/Dory nicknames (my MIL goes by Do or Dodo with her close family) – they’re fun and fine, but just not for us. The nickname Dot for me, however, would really put me off – I had a very nasty neighbor called Dot for many years and would want to avoid any thought of her that I could! It’s also kind of short and abrupt for my ear (maybe Dottie would be alright, thinking about it). Isn’t fun(ny) how visceral a reaction one can have to a single syllable!? I’ll third Middlemarch and also agree with Nessa and Lola that Dorothea would be a great sis name for Josephine!!! I like them both. I love Dorothy because it’s so happy and rather old ladyish, but I think it’d be fresh on a little one. Plus, I’m a big Wizard of Oz fan (though if I were to name a baby after it, I’d lean more towards Elphaba from Wicked). Lola, Dorothea would be such a great sister for Josephine! It’s nice how all the consonant sounds are so different, but they have a similar flow, but not too similar! All the nickname options are adorable, too, it wouldn’t have occurred to me that there are so many choices. I like Dorothea and Dorothy. My mom recently suggested the name Dorothy to me, since it’s a family name for us — it’s still not a top favorite, but it’s on the long list. I think I prefer Dorothea. In addition to being a saint’s name, she was also the heroine of George Eliot’s “Middlemarch” (one of the best English novels I’ve ever read). Either one is lovely, though, and while some might find Dorothy dated, I think most would find her rather charming. […] have already started to catch the attention of parents looking for something fresh. […] Joseph, Brawk David, and Dash Ayden.